Taking responsibility involves accepting personal accountability for one’s actions and commitments and is a crucial contributor to effectiveness in the workplace and beyond. You are totally responsible for your life. This is the foundation principle you must embrace if you plan for happiness and success in life and work. …Excuses for failure, excuses about your choices in life, excuses about what you feel you have accomplished fuel dysfunctional thinking – and consequently, undesirable actions and behaviors. Making excuses instead of taking one hundred percent responsibility for your actions, your thoughts, and your goals is the hallmark of people who fail to succeed. … When you spend your thinking time on success and goal accomplishment, instead of on making excuses, you free up the emotional space formerly inhabited by negativity. 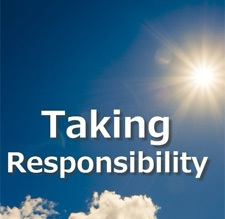 Susan Heathfield, Take Responsibility for Your Life, at http://humanresources.about.com/od/success/qt/responsible_s5.htm, accessed 16 February 2016. Michigan State University – Human Resources, Behavioral Competencies, on Atlas at Michigan State Behavioral Competencies, original at https://www.hr.msu.edu/performance/supportstaff/competencies.htm, accessed 15 February 2016. OECD Competency Framework, on Atlas at OECD Core Competencies, original at http://www.oecd.org/careers/competency_framework_en.pdf, accessed 7 January 2016. Image: Recapo, http://www.recapo.com/dr-phil/dr-phil-relationships/dr-phil-traumatic-childhood-abuse-taking-responsibility/, accessed 16 February 2016.